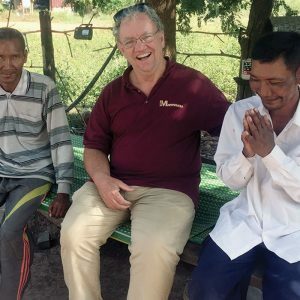 While Maryknoll missioners’ experiences overseas vary as much as the countries and cultures to which we go, these experiences all share one common characteristic: the encounters transform us. Our faith, our ideas, our attitudes all crash—like waves on rocks—against the harsh reality people face. You might say theology is what happens when what we believe rubs against the rough edges of reality. Yes, as missioners we go overseas to support, comfort, console and encourage people, but in the end we realize this process has also transformed us. We see people in a new light as they go through their own Way of the Cross. For some, life is indeed a crucifixion. A precious few eventually experience rebirth, renewal and healing. For the vast majority of people, however, most of life happens in that limbo area between Good Friday and Easter Sunday. The challenge for us is to recognize and encounter Christ even there. Or Jesus may have reminded them of one of Isaiah’s several prophecies about “God’s Suffering Servant.” Jesus may have explained to them how suffering for the sake of the Kingdom of God reveals the glory of God. Suddenly the disciples got a brief glimpse into exactly who this Jesus of Nazareth really is: not just a carpenter, more than a rabbi, preacher or healer. Beyond even their wildest hope in a Messiah, he was the Son of God! The Law, represented by Moses appearing on Mount Tabor, and the prophets, symbolized by the appearance of Elijah, bore witness to the glory of God to be revealed in the least expected and most scandalous manner: the impending crucifixion of Jesus. And in this awareness, the disciples awakened to the realization they were in the very presence of God! This epiphany lasted a moment. Did a spark remain in their hearts to sustain them during those darkest hours of doubt, fear, sadness and despair following Jesus’ crucifixion? Perhaps. But not even encountering the Risen Christ erased their doubts. It would be nothing less than the Holy Spirit to fan their faltering faith back to flames. Yes, Jesus was transfigured on Mount Tabor, but the disciples would not be transformed until Pentecost. We too must allow our faith to transform us. Faith is about transformation: a virgin into a mother, God into a human, water into wine, sinners into saints, bread and wine into the body and blood of Christ! Our Eucharist does not end at the altar, but must carry us out into the world where, giving us the strength and courage to put our faith into action, it carries on the transformation of the world begun by Christ.